This easy spread has an aioli-like consistency but uses no eggs. 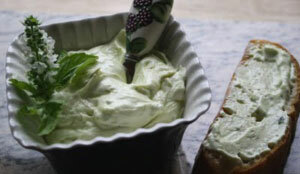 Instead, fresh, part skim ricotta stands in lending a creamy-dreamy texture and richness. A clove of garlic, squeeze of lemon and sprig of basil later, the spread came together magnificently. Toast some bread and liberally slather it with the spread. However, it would would be equally delicious as a mayonnaise replacement, a dip for crudites, or spread fresh grilled salmon.